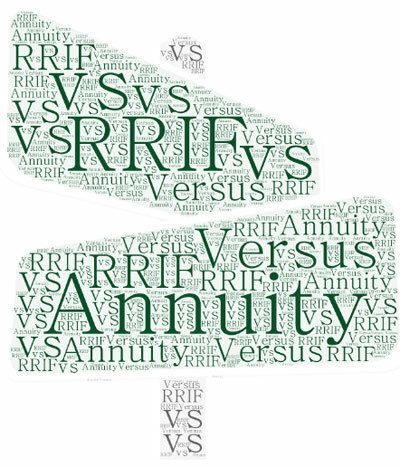 Which is better, a RRIF or an Annuity? The Canada Revenue Agency, requires that you cash in or convert your retirement savings into an income stream by the end of the year in which you turn 71. How can you convert your RRSP? You can withdraw your retirement income from your RRSP in cash but the full amount of the withdrawal will be added to your income. Because the amount of the withdrawal will likely be large, your savings will be taxed at the highest rate. You can purchase a registered annuity from an insurance company. Annuities are ideal if you want to cover your fixed expenses, are concerned about outliving your retirement capital or if you don't want to make ongoing investments decisions. You can blend the RRIF and annuity option. You can transfer your funds to a registered retirement income fund (RRIF) where you can continue to manage their investments in the stock market etc. Will RRIF's or Annuities Pay More? Whether RRIFs or annuities will pay you more, depends on your age, interest rates, and the rate of return generated in your RRIF with a GIC or other approved investment. Your health and the health of your spouse. If preservation of capital for your children is important. How involved you want to be in management of your RRIF. Video: Should I buy a life annuity or a RRIF? If you're only interested in guaranteed investments such as GICs, then a life annuity is probably your best bet. Registered annuities will almost invariably give you a higher retirement income than a RRIF, without any fear of running out of money or stock market crashes. RRIFs are more attractive when you are able to obtain higher rates of return. The only way to achieve higher rates of return, is by investing in stocks or equity funds. If you feel a balanced approach is a good compromise, then use a life annuity for the guaranteed portion. If the annuity income is sufficient to meet your basic needs, this approach allows you to be more aggressive with your RRIF investments. The younger you are, the longer your retirement income must last. Statistics show that if you are age 68, the chances are you will live 17 years longer for men and 19 years longer for women (see the Annuity Mortality Table). For a husband and wife, this means that there is probably a 60% chance that one of you will survive into your nineties, and you don't want your income to expire before you do! Running out of money is one of the greatest dangers with a RRIF. Annuity income is affected by your age and minimum payment guarantee. The longer the guarantee, the smaller the amount each monthly or annual payment. This is the reason joint and last survivor annuities pay less than annuities on only one life. The insurance company providing the annuity will base its calculations on the average length of time you're expected to live. , whereas with a RRIF it is your responsibility to ensure your RRIF income will last. The table below briefly summarizes a few factors you might want to consider when making your decision between a RRIF or an annuity. Once you have commenced your RRIF, you cannot make further contributions from earned income. You must make withdrawals, subject to prescribed minimums, every year for the rest of your life or until all the funds in your RRIF are withdrawn. An annuity is, in essence, the reverse of a mortgage. In the case of a mortgage, you borrow a lump sum, then, over a fixed period of time, repay the capital together with interest. In the case of an annuity, you invest the lump sum to a financial institution which, over a fixed period of time or your lifetime, repays your capital together with interest. You retain personal control of your investments. You can change the amount of your income. You can make lump sum withdrawals at any time. A life annuity guarantees that you cannot outlive your income. Annuities usually pay higher income than RRIFs. Neither you or your spouse are required to make any investment or management decisions. You can spend every income payment without worry because your future income is guaranteed. You may outlive your RRIF income. Your capital may diminish more quickly than planned because of lump sum withdrawals or poor investment performance. Your RRIF requires continuing investment management decisions. 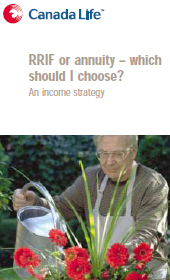 Download the Canada Life's client brochure: "RRIF or Annuity". RRIFs are sold by most, if not all, financial institutions but life annuities are generally available only from life insurance companies. However, both RRIFs and annuities are sold by licensed, independent life insurance brokers.